Contrary to what most people believe, temporary hair loss is quite common among women; research suggests that around 30 percent of women in the US experience it in some form. The worst part? 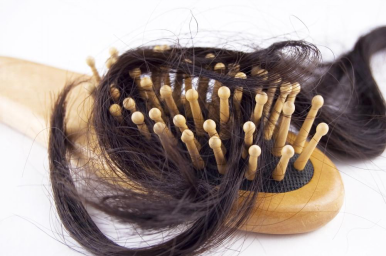 Hair loss, whether temporary or permanent, comes with a huge emotional toll. It’s a known fact that when you’re undergoing a very high-stress circumstance, your body’s hormonal balance can be disturbed. Both your cortisol and adrenaline levels rise significantly, causing a number of bodily changes. In regard to your hair, increased cortisol levels cause your hair follicles to transition from the growing phase to the resting phase. Cortisol also causes hair to shed faster, meaning that not only does your hair grow slower, but you also lose more of it. The good news is that once the stressful situation has passed, you can expect normal growth within 3–6 months. On the other hand, if you’re the kind of person who takes stress whenever a difficult situation arises, it may be wise to start practicing stress management techniques or go to a mental health professional to help you alleviate it. This is a form of temporary hair loss that’s caused by the excessive pulling of the hair, both due to physical stress and because of tight hairstyles. You can be susceptible to traction alopecia if you wear your hair in braids, cornrows, tight ponytails, etc. Since all of these hairstyles pull at your hair, your hair follicles weaken over time; eventually, they can scar and even cause permanent hair loss! Traction alopecia can be fully reversed if tended to immediately. Firstly, stop wearing your hair in styles that are too tight. The second step is to take better care of it in the aftermath. Stop brushing it when it’s wet, for example, because this can cause breakages. Whether it’s chemotherapy to deal with some kind of cancer that you’ve developed, hypothyroidism in the thyroid that’s slowing down your metabolic functions (including hair growth), or a whole host of other treatments and conditions, temporary hair loss is a common side effect. Temporary hair loss can even be brought on by medications such as beta blockers, HRT-related hormones, and antidepressants, to name a few. If you’re currently undergoing treatment for a condition, there’s nothing you can do apart from waiting it out. Make sure you have a solid support system to help you through this troubling time, and that you know that there are solutions out there. From hair restoration to hair extensions services, hope is not lost. If a medication you’re on is causing hair loss, consider asking your doctor if there’s a replacement. While most pregnant women develop beautiful hair during their pregnancy, after it’s over, the hormonal changes can wreak havoc on your hair. From excessive shedding to hair thinning, it can be a worrying time. Remember that these changes are normal. For the first three months, you can expect hair loss that exceeds normal levels. If your hair growth rate doesn’t recover over the course of a year, however, you should see a medical professional. Hair Extensions of Houston is a luxury hair salon in Houston, TX that offers professional hair, hair styling, extensions installation, and hair restoration services. If you’re experiencing hair loss or find your hair thinning, our Low-Level Light Therapy (LLLT) can work wonders for you. Book an appointment today by reaching out to us at 832-717-3626.